Mani H. Zadeh, M.D., F.A.C.S. is a board-certified Otolaryngologist-Head and Neck Surgeon and a member of the American Academy of Otolaryngology-Head and Neck Surgery and a fellow of the American College of Surgeons. Dr. Zadeh specializes in disorders of the Ear, Nose and Throat and practices in Los Angeles, California. 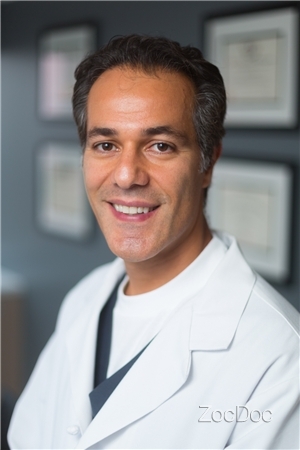 After attending high school in London, Dr. Zadeh earned his Bachelor's degree at the University of California, Los Angeles (UCLA), where he graduated with honors. Dr. Zadeh received his medical degree from University of California, San Diego. He then completed his General Surgery internship followed by residency in Otolaryngology-Head and Neck Surgery at the prestigious Columbia University in New York. Dr. Zadeh is recognized as a leader in the field of Otolaryngology ?Head and Neck Surgery and is often consulted by his peers to evaluate patients with complex and advanced disease. Dr. Zadeh is featured in the "Super Doctors" section of Los Angeles Magazine. In a survey of physicians in Southern California aimed to identify the top Otolaryngologists in the community, Dr. Zadeh was selected as a "Super Doctor". Dr. Zadeh is honored to be recognized by his peers as one of the best Otolaryngologists-Head and Neck Surgeons in Southern California. Dr. Zadeh has been involved in multiple research projects exploring subjects such as sinus disease, head and neck cancer, and hearing loss. He is the author of numerous articles in peer reviewed journals and has presented his work at many national meetings. Dr. Zadeh has won numerous awards for his teaching, research and patient care. Dr. Zadeh's wealth of expertise in the field of Otolaryngology as well as his dedication to patient care has earned him the reputation of one of the best Otolaryngologists-Head and Neck Surgeons in Southern California. Super Doctors Super Doctors identifies top doctors as chosen by their peers and through the independent research of Key Professional Media. Dr. Zadeh is one of the most thorough and caring doctors I have ever been to. He spends lots of time with you, returns your phone calls and seems to really care about finding the best solution to your problem. I highly recommend him. Dr. Zadeh actually listens to you...it's a simple, yet incredibly powerful thing. You can tell he genuinely cares about his patients. You can feel 100% confident in your choice of Dr. Zadeh. He is the most caring, attentive, and gentle doctor I have ever had. I can truly say I felt safe with him and was truly in good hands. Dr. Mani Zadeh, MD has no appointments on Zocdoc right now.